The 2004 funds will be used for the expansion and security update for the existing Courthouse, Geddings said. A part of the 2009 funds already have been committed for the county’s farmland protection program, Geddings told the Commissioners. County Administrator Justin Kirouac is to recommend tomorrow (Tuesday) night at the Board of Commissioners meeting that Kevin Price Construction, 2500 Daniells Bridge Road, be awarded a contract for Construction Management at Risk for the Courthouse work. Early voting for the Dec. 4 runoff election began today opposite the Courthouse in the Board of Elections and Registration Office. At the end of the day, 586 persons had cast a ballot. The General Fund balance is $10,165,729, Gedding said. The General Fund is the savings account of the county. 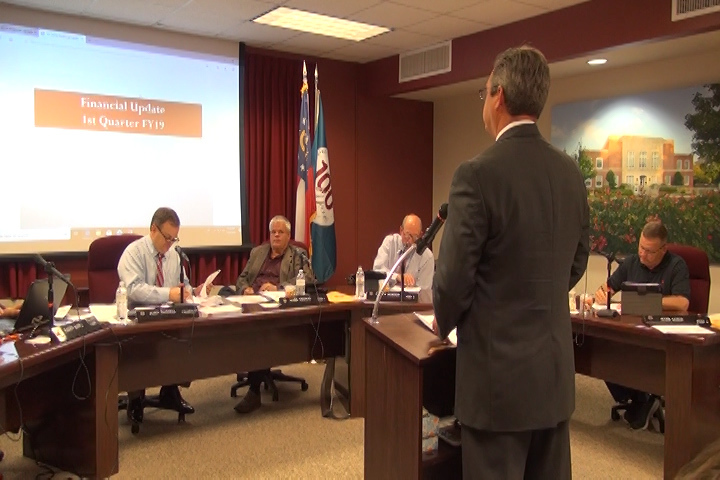 Revenue for July, August and September is on track, Geddings said, and spending is under what has been projected. SPLOST and Local Option Sales Tax revenues for the first three months of the fiscal year are up 14.1 percent over those months a year ago, Geddings said. “We are still a little bit behind because we had some lean years on the front end,” Gedding said. Charts Geddings presented showed the county has collected only $17.1 million of the originally projected $55 million for the tax, which expires in 2021. Collection began on Oct. 1, 2015, meaning the county is about half way through collection. The county collected just more than $4 million for the Courthouse Facilities Expansion and Renovation as part of the 2004 SPLOST but had spent only $1.5 million of that amount going into the current fiscal year, according to a chart Geddings presented at the Nov. 6 meeting. All of the other categories of funding for the 2004 SPLOST have been exhausted. The 2009 SPLOST account has unspent money for Recreation, Historic and Scenic Facilities, Fire Station Facilities and Equipment, and Farmland Protection. Most of the $483,904 in unspent money for Fire Station Facilities and Equipment will be spent this year, Geddings said, as the county completes work on Fire Station No. 8 on Virgil Langford Road. The Board of Commissioners at its Aug. 28 meeting approved spending $463,615 as part of the cost of easements restricting development on four farms selected for the county’s farmland protection program. Geddings said at that time that the money would come from the 2009 SPLOST as well as the 2015 SPLOST. The 2009 SPLOST has $129,966 in unspent funds for Farmland Protection, and $180,563 already has been collected in the 2015 SPLOST. Geddings made no mention in his presentation of unspent funds in the 2009 SPLOST for Recreational, Historic and Scenic Facilities. Historic and Scenic Facilities were lumped with Recreation in the 2009 SPLOST, and Commissioners have said in the past that the unspent $224,451 should be used for Historic and Scenic Facilities, in keeping with the spirit of the tax approved by voters. In the 2015 SPLOST, Historic and Scenic Facilities were given their own category, and Geddings reported that $90,282 already has been collected. The Commissioners have not responded to requests on use of that money, including a proposal for a History Museum on the Oconee River. Geddings reported that the county has $260,845 in unspent money in the 2015 SPLOST for Animal Control Facilities and that $50,000 has been designated for spending this year. County Administrator Kirouac told me in an email message after the meeting that the $50,000 is for architectural services for renovations at the current facility. The money will be spent this fiscal year, Kirouac said. Geddings began his report at 59:21 in the video below. The bulk of the Nov. 6 meeting was taken up with zoning matters, including an appeal of an administrative decision prohibiting use of slab foundations on several lots in Pebble Creek Subdivision on SR 15 in the south of the county. The Commissioners turned down the appeal. The Commissioners approved four variance requests for Townley Family Partnership LLLP associated with its plans for the Eastville Car Museum off Snows Mill Road. OCO: BOC 11 6 18 from Lee Becker on Vimeo. "The 2004 SPLOST account currently has $2.5 million in unspent funds"
We would we ever trust this Board of Commissioners with SPLOST funds. Well past time for a SPLOST Citizen's Advisory Board. Shameful. I agree Anonymous, but not the fault of only this Board, but the previous ones as well. They like to save the money for the future. Unfortunately, they may have overestimated the income from the current SPLOST. It sure would be nice to have water and restrooms at the parking area at Heritage with the money for historic and scenic areas.